It's February, 2016, and it's that time of the month where we go to our comic shops, pick up our comics, and then read them, read-read-read, until finally what we read manages to quench our thirst for adventure. Lets hope Charles Soule, Ron Garney, and Marvel Comics, are good quenchers, eh? Or else I may fade out and dry. TO QUOTE Herman Hesse: 'The marvel of the Bhagavad-Gita is its truly beautiful revelation of life's wisdom which enables philosophy to blossom into religion'. 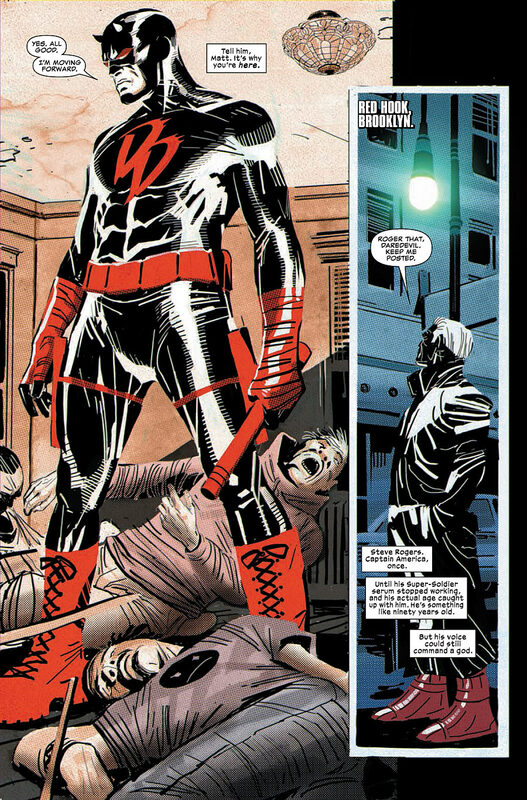 In a round about way this third Daredevil comic book fills us in on what the previous two chapters merely eluded to. In one part of it we find out the circumstances behind Matt's initial involvement with this new Tenfingers case: It's because an aging Steve Rogers told him to investigate why Tenfingers is causing trouble in his old neighborhood. On the other hand, another part of it touches upon Matt's motivations for wanting to train his new assistant, 'Blindspot': Simply because he sees someone very much like himself, a lone figure wanting to do good for the people in his community. Furthermore, another part of this tale is a reclassification of sorts, a reclassification as to how many people can remember Matt being Daredevil: Answer... Not very many. However, apart from this adventure redefining and updating us on certain scenarios, to me, what it does best, is to make Matt doubt himself where it comes to him fending off Tenfingers, and sewing that seed of doubt with Tenfingers playing Matt's own motivations against his need for justice. I mean, let's face it. Matt isn't a sanctioned hero despite him wanting to help out his fellow New Yorker. So I'm sure you'd agree, it's fairly hypocritical of him judging others, if he himself doesn't like to be judged in turn! Saying that, though, once this seed of doubt is finally played out, the basic narrative then ventures back to a more tried and tested territory: Story-telling territory. 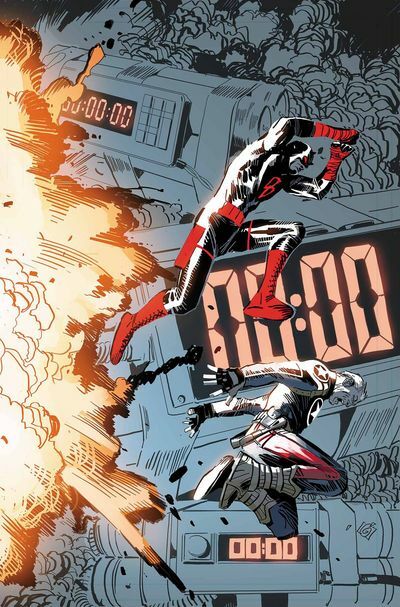 One part of the story is focused on Steve talking to Matt via a head-set, and telling him how to take down a group of hoods while he's doing it (Loved that part with the bomb! Classic!). Whilst another part of the plot was focused on Sam, one of Tenfingers henchmen who failed to killed Billy Li, and how he unveils to his mother a revelation we all saw coming two issues ago. No. Don't worry. If you haven't guessed by now, I won't spoil this for you (I can do that in my conclusion, Ha!). Yet what I can say is that there were two things in this issue that I loved the most. One of them would have to be the inclusion of Steve Rogers: As that's always a bonus in any book; whilst the other was Ron Garney's monotone yet vibrant artwork: As that's growing on me by the issue. So overall, yeah, this was a pretty decent episode of Daredevil. Revelations were revealed. Artwork was proudly on display. And all in all, good job, and let's see what we'll have in store next month. One slice of this adventure was kind of focused on Sam and his relationship with his renegade mother. So, in honor of this union, I'd like to dedicate the following song to them both. Take it away John Lennon, with your song, 'Mother'. Now if Matt were the hero of this piece, and Tenfingers the villain, what would that make Steve Rogers? Oi! Cut that out! I'll have no name calling here, my friend. Anyway, he doesn't look anything like Marv from Sin City. What Steve does look like, though, is a man at the end of his life wanting to help out a person and a community in need. 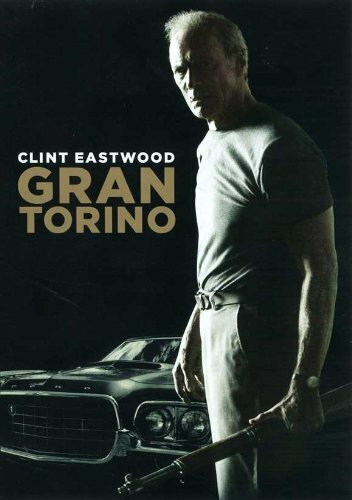 You know, just like what Clint Eastwood's character did in the film, Gran Torino. Slightly deaf in the left ear. An alien from the planet spelling-mistake. The hero known as Blindspot. Captain America's Bucky -- take that any way you want.